Salmon is a popular and healthy food, it's high in protein, omega-3 fatty acids, and vitamin D. I love eating salmon but most of the time I just eat salmon as sashimi. I feel when salmon is well done it tastes a little bit too dry and old. I have been looking for a good salmon recipe for a long time because my 2-year-old daughter is finally on a fully solid diet and I want her to enjoy this fish safely (she is too young for raw food). Salmon doesn't spawn in China, so there is not a lot of Chinese recipes for salmon. Luckily I found this wonderful recipe from a Taiwanese cook book and I made this Salmon Fried Rice for dinner last week and it was so delicious! My daughter loved this dish. She had so much of it. I diced the salmon so it's perfect for her little fingers to pick up. I served this Salmon Fried Rice along with some rice and some Sautéed Choy Sum with Chopped Garlic. 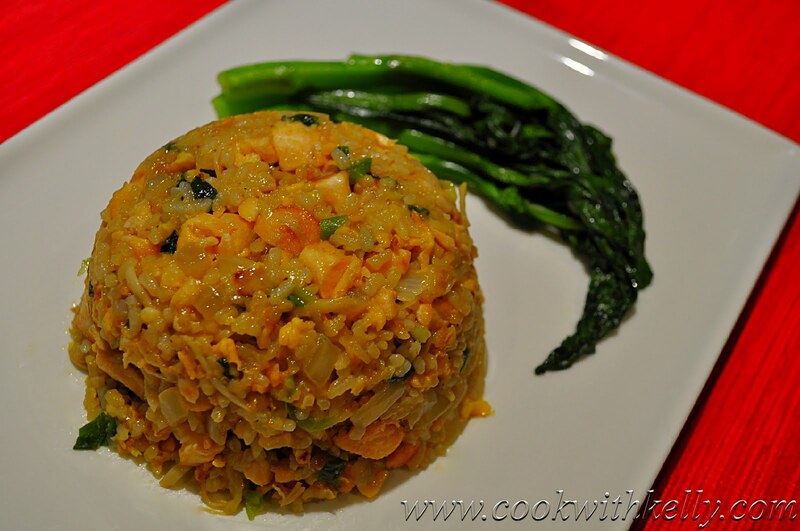 However this fried rice combines vegetable, salmon and rice so you can just enjoy it as a complete meal. Dice the salmon. Beat the eggs in a bowl. In a nonstick pan, heat up 1 tbsp olive oil over medium-high heat. Add salmon to fry. About 3 minutes, when the salmon turns golden, transfer all the salmon to a plate. In a nonstick medium saucepan or a wok, heat 1 tbsp oil over medium-high heat. Add egg and cook. Stir the egg for a minute, and then add rice. Press the rice, make sure the rice is lose and mix with the egg evenly. About 2 - 3 minutes, add green onion, white onion and enoki mushrooms. Stir everything evenly and keep stir-frying for about 3 - 4 minutes, until all the white onion is tender. Add the cooked salmon. Mix everything evenly and stir for a minute, add salt, white pepper powder, soy sauce and cooking wine. Transfer everything to a serving plate. Now you are finished! Yummy! 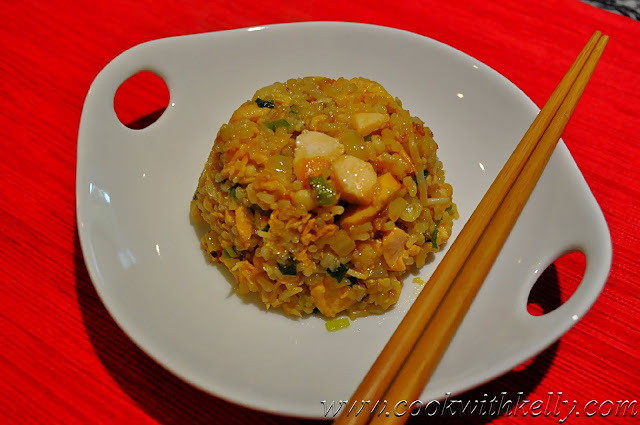 I love salmon fried rice too and added luncheon meat in it too. Thanks for stopping by! What a great idea! I will add some luncheon meat too next time and see how I like it! I like Salmon, which is a good source of vitamin D. This is a healthy meal and looks like delicous. I will try this on the weekend. Thanks for sharing.